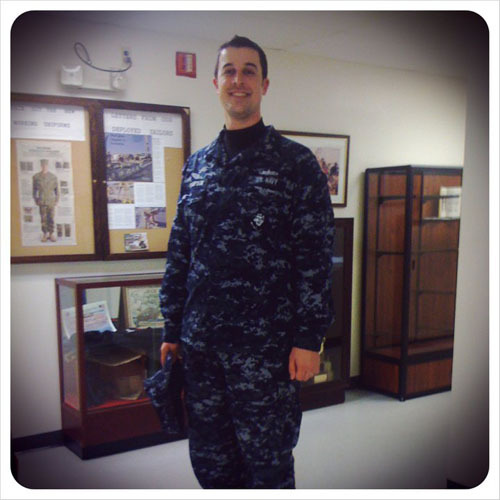 Most people know Aaron is in the Navy Reserves. Recently he got orders that he has been reactivated for 6 months and will be reporting to Bahrain. He was in Bahrain once before about 6 years ago, so he is pretty familiar with the routine. It stinks of course but there are a lot more ways to connect online than there was back then and I have lots of plans to keep me busy. Here's to hoping the time will go quickly and Aaron will come home safe and sound. After years of daily enjoying your blog, ... I now type my very first comment, just to say: Stay save, stay connected, lots of luck and blessings to you both! Sending lots of positive vibes toward your family. Safe travels Aaron! Aaron. Hope the time passes quickly for both of you. It is tough to see such a lovely couple separated. Best Wishes. Just chiming in to thank Aaron and you for your service. I hope the time passes swiftly for you both. Please take good care, and I am looking forward to reading about his safe return. I don't know how I missed this in all my years reading your blog, but I wish him very safe travels. I think you should plan a trip out here to LA for a long weekend or something, Jenny, while he's gone. You've got a billion blog pals (like ME), who'd be happy to entertain you! Wishing Aaron a safe return! Wishing Aaron a safe return back home. Wishing you both the best. I'll do my part to entertain you when I'm in town at the end of the month. Oooh, another long longtime reader wishing you both much love and luck! Jenny, I've been following your blog for, gasp, years now. Like others, I feel compelled to wish you and Aaron the best on his journey.Safe travels! I've been following your blog for some time also and wish Aaron safe travels in his recent duty. As a fellow military wife, I understand deployment separation and the challenges it can bring. It can also bring opportunities for self-discovery and relationship strengthening with your significant other, so I encourage you to seek the opportunity in the challenge :) Best wishes to you both! I have been reading your blog for so long, I remember when Aaron returned from his last tour of duty. Many thanks Aaron for the service he is providing for the rest of us!! Stay safe, Aaron. We appreciate your service. Hi! I read your blog all the way from Singapore but I've never commented :) Still, here's wishing safe travels to Aaron! here's hoping for a swift & safe return for Aaron! Wishing Aaron a speedy and safe return! I am so thankful for Aaron's service, but man, I am sorry you have to be without him for six months! I'll be keeping you both in my thoughts. I'm a long time reader and admirer of your blog - I think you (and Aaron) are the coolest! p.s. Any plans to attend the BlogHer Handmade event in Minnesota in September? http://www.thecreativeconnectionevent.com/ I hope to go and would love to say hi. Thank you everyone for your thoughtful comments! i'm a lurker too. but just had to say THANK YOU to aaron. stay safe. Thank you everyone for your thoughtfulness! best of luck, aaron! safe travels! I echo those above. Stay safe, hurry home, love the blog, and projects and crafts, and thank you for your sacrifice. Take care and best of everything for the next six months Aaron and Jenny. Wishing Aaron a safe trip and for the time to fly by for both of you! Holy cow, I also remember the last time he went. Six years?? Wow. Geesh. I'm so behind on reading my blog reader. Hope Aaron stays safe. Hugs.